Above is a pastel and some would say painterly view of the Red Deer River passing through Rosedale, Alberta, on August 26th. Below you see a cliff that’s on the same side of the river and that doesn’t hold on tightly to its future as a cliff. 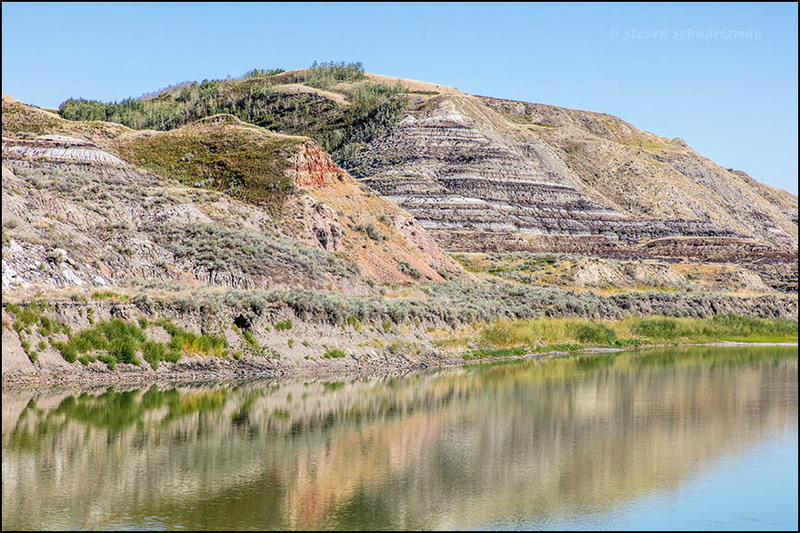 These two views tell you you’re looking at a part, more colorful than many others, of the Canadian Badlands. First scene is serene, the second is scary (to me). I like my cliffs stable. I appreciate the serenity of the first view, too, especially given the many people close by. A narrow pedestrian bridge crosses the river there, the Star Mine Suspension Bridge, and people’s footsteps caused its deck to undulate. Imagine trying to take pictures while what you’re standing on is shaking: not fun. Not fun and not easy. We could get metaphorical and say that our world is often shaken, and yet we cope and persist. Did the hero escape from what seemed like certain disaster? Come back for next week’s matinee and pay your 25¢ to find out. On a completely different note, I just read about the carp that are invading the waters here in Illinois and how the silver carp leap out of the water and smack people in the head….they don’t like motors, evidently. Apparently there are some good youtube videos of it that I’m going to go see if I can find. If our hero survives his cliff, perhaps he will amuse us by waterskiing in carp-infested water…stay tuned! I’ve heard about those carp and have seen some videos of the kind you’re talking about. I forget whether it was on television or on the Internet. The delicatessens on Long Island used to sell smoked carp, so maybe that’s one way to get rid of these invasive fish. I see that dog and cat food often feature salmon. Can’t see feeding such a valuable fish to dogs and cats, but surely they could provide a use for the carp. Also fertilizer. I think we think about things wrong here in America. Rather than think of invading species as nuisances to be gotten rid of at any cost (and the cost is high) we should be looking for ways to make use of them. Or at least to learn from them. You’re sure right about the cost and difficulty of getting rid of invasive species. It’s good of you to accentuate the positive by suggesting we look at ways to use the alien species. Most of our food crops are alien, after all. True. I was enchanted when I learned that much of what early settlers thought was virgin forest both here and in the jungles was, in fact, a carefully tended garden of sorts curated by the native peoples. I was surprised when I learned about that a couple of years ago. Me too. It turned all of our assumptions on their heads. And yet, frustratingly, ecologists are stubbornly still trying to hold a version of nature in place using force. I suspect the cost of not getting rid of invasives like giant salvinia, water hyacinth, zebra mussels, and feral hogs is higher than any of us would want to pay. Of course, since humans are responsible for much of the damage (introducing salvinia through the aquarium and water garden trade, for example), education and enforcement of regulations meant to prevent further spreading are an essential first step. Volunteers talking to fishermen and pleasure boaters at local ramps about the mussels and salvinia are a great example of lower-cost approaches that can support larger-scale efforts. When we were in the Canadian Rockies we noticed places where drivers hauling boats were required to pull over, I think for the kind of talking-to you mentioned. We also saw signs warning about the dangers of boats’ spreading invasive species from one body of water to another. On a native plant field trip some years ago we went to a property where feral hogs had been hunted. Yes, we have volunteers and staff doing that here at boat ramps too. But I see the ecologists using increasing amounts of chemicals to “control” invading species, only to need to do it again. And again. Meanwhile nobody is talking about the residues building up in the soils and making their way to the water. Regarding the carp, I know of at least a few instances where they poisoned stretches of the river, killing 10,000lbs of native fish just to be sure there weren’t any carp present. There is something terribly wrong with that picture I think. But I agree about the first step. You are absolutely right and often it is just a matter of educating people. The 2nd shot could also be called painterly — soon to be just a pigment of your imagination. Sorry. Marvelous place and shots, Steve! Agreed. It was well worth spending time there. The variety of layers, colors, and growth in that first photo reminds me again that much of nature can be “read.” There are wonderful stories there, as well as the visual beauty. I was surprised to see some of the highway cut-throughs in the hill country resembling that second section of cliff. For the most part, the limestone is holding, but there were places where new “falling rock” and “fallen rock” signs had been posted. Gravity, freezing, thawing, and time will do their work. The freezing ~ thawing alternation is so much more severe in Alberta than in central Texas that I wasn’t surprised to see such a tumbledown cliff as the one in the second photograph, along with others elsewhere during the trip. Still, time, which you also mentioned, must be the biggest destroyer of them all. 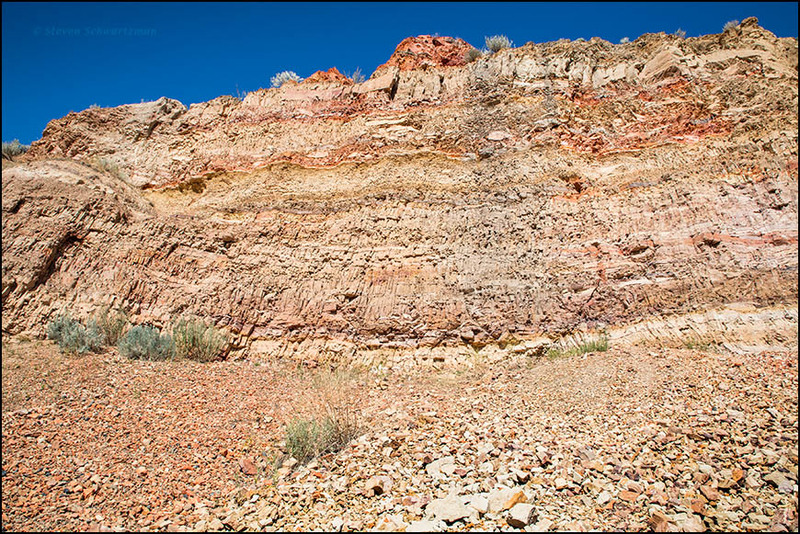 Various places in the Alberta Badlands have proved among the most fertile in the world for fossils in general and dinosaurs in particular. The other night, while watching PBS’s “What Killed the Dinosaurs?”, I was impressed by how easily the paleontologists could look at a bunch of rocks and infer so much about them. All I saw was a bunch of rocks.